During Easter week, my family and I prepare a variety of celebratory foods. 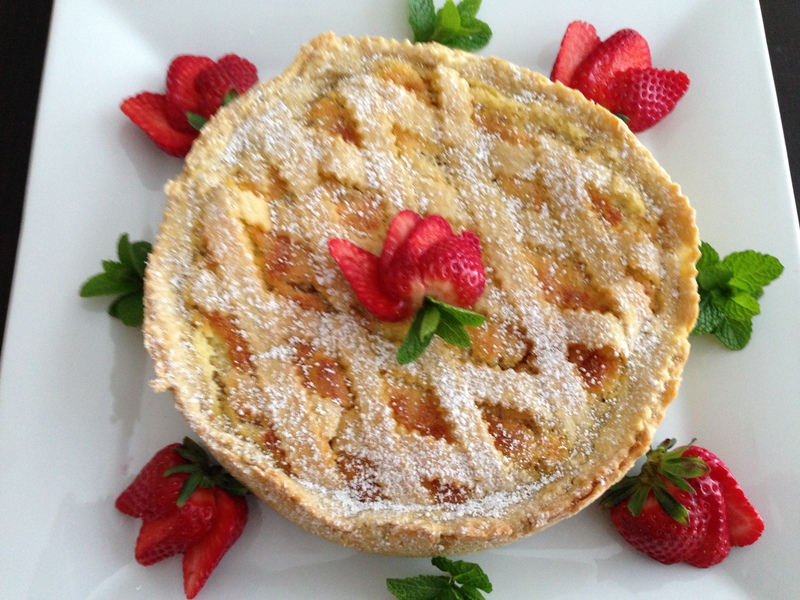 In my opinion, the best is always saved for last – the traditional ricotta cake. Encased in pasta frolla or a sweet shortcrust pastry dough, the ricotta filling is rich with rum, cinnamon, sugar and eggs. The flavors of this ricotta cake bring back all the memories of Easter in Italy. It doesn’t get more authentic than this. Happy Easter and Happy Spring! 1. Combine dry ingredients in a 12-cup mixing bowl. 2. Using a pastry cutter or a fork, blend in the butter until mixture is uniform and resembles small peas. 3. Mix in the eggs. Add water, one tablespoon at a time, mixing gently after each addition. 4. As soon as mixture amalgamates and dough is formed, divide it in half; shape each piece into a ball. 5. Wrap each dough ball in plastic wrap and freeze 10 minutes. 6. After 10 minutes, transfer dough balls to refrigerator while you prepare the ricotta filling. 2. In a 2 to 3-quart mixing bowl, using a wire whisk, stir together all ingredients. 3. Make sure the ingredients are well-blended; cover the bowl and refrigerate the ricotta filling. 4. In the meantime, roll out the pastry dough. 1. With lightly floured hands, flatten one dough ball to a 6-inch circle. 2. Place dough between two floured 16-inch long waxed paper sheets. 3. Gently roll out dough to a 14 or 15-inch circle. To prevent sticking, peel off the waxed paper sheets and dust each side of the pastry sheet with flour two or three times while working. 4. Peel off the top waxed paper sheet. With one hand underneath bottom sheet and the other on top of exposed pastry, quickly flip pastry over and into a 9-inch buttered pie plate. 5. Peel off the second sheet. Gently fit the pastry into plate sides and, using a fork, randomly make holes in the pastry. Trim edges to a one-inch overhang and set aside. 6. Repeat rolling instructions with other dough ball; set aside. 7. Peel off the top waxed paper sheet from rolled out pastry; set aside. 1. Pour the ricotta filling into the pastry-lined pie plate; set aside. 2. Using a pastry wheel, cut the second rolled-out pastry into 1/2 to 3/4-inch wide strips. 3. Place the longest pastry dough strip across the center surface of ricotta filling. 4. Take the next longest strip and place it one inch apart and parallel to the first strip. 5. Continue placing the strips, one inch apart, until there are about 5 strips across filling surface. 6. In a diagonal fashion, place the remaining strips, in the same manner, over the first layer of strips. 7. Trim overhang pastry to one inch; roll the overhang underneath and tuck it between the plate and the pastry edges. 8. Using 1-inch wide aluminum foil strips, cover the pastry edges (this will avoid blackening). 9. Bake the ricotta cake for about 30 to 45 minutes. 10. After 30 minutes and to test doneness of cake, insert a pointed knife in center of cake. If it comes out clean, the cake is done. If not, bake the cake for an additional 8 to 10 minutes. Test again. 11. When cake is done, transfer it to a cooling rack or counter. Let cool to room temperature. 12. Cover the cake with aluminum foil or plastic wrap and refrigerate for 3 to 4 hours or overnight. 13. Serve cake with a sprinkle of powdered sugar, 5-Minute Sweetened Whipped Cream (see above) and fresh strawberries. Frosted with chocolate ganache, this flourless cake is absolutely magnifique for February 14th! First, shop for Valentine’s Day decorations. Then, make the cake and enjoy the romance. Happy Valentine’s Day! 1. Preheat oven to 350°F oven. Butter a 9-inch springform pan. 2. Place a 9-inch round parchment paper circle at bottom of pan; dust the sides of pan with flour, shaking off excess. 3. Fill a double-boiler pan with about 2 inches of water. Place the double boiler element over the pan and place on stove burner set on high heat. 4. Add the chocolate, rum, butter and sugar to the double boiler. As the mixture heats, stir it with a wooden spoon until it becomes uniform. 5. When chocolate mixture is uniform, remove the pan from heat and allow to cool a little. 6. Meanwhile, in a 2 or 3-quart mixing bowl, beat the egg whites until stiff peaks form. Set egg whites aside. 7. In a separate 1-pint bowl, beat the egg yolks until they are uniform. 8. With a spatula, transfer the chocolate mixture to a 3-quart mixing bowl. 9. Gently stir the beaten egg yolks into the runny chocolate mixture. 10. Stir the ground almonds into the chocolate-egg yolk mixture. 11. Gently fold the stiff egg whites into the chocolate batter, taking care not to mash or deflate the egg whites. 12. When mixture is uniform, transfer it to the prepared spring form pan. 13. Place the spring form pan on a rack positioned in center of oven. 14. Bake the cake for 25 minutes. After 25 minutes, check to see if the center of cake has puffed up. If it still looks sunken and wet, bake the cake for an additional 5 minutes. 15. After 5 minutes, if the cake looks puffed up, insert a knife with pointed tip in center of cake. If knife comes out clean, the cake is done. 16. Transfer the cake to a rack or trivet set on a counter; let it cool completely. 17. When cake has cooled completely, remove the sides of spring form pan. 18. Invert the cake over a platter and gently lift off the pan bottom. 19. Peel off the parchment paper and set cake aside. 1. Place chocolate and rum in a medium glass or porcelain bowl (it should be heatproof). 2. Place cream in a small saucepan over medium heat and bring to a simmer. 3. When the cream has just begun to simmer, immediately pour it over the chocolate in bowl and let it stand 2 to 3 minutes. 4. After 2 to 3 minutes, whisk the chocolate-cream mixture until smooth. Let cool slightly before using. Set aside. 1. Pour the runny ganache over cake, start pouring in center of cake and then pour over rim/sides of cake. 2. Let the ganache forms drips over the cake sides. 3. Set the cake aside so that the ganache will solidify – about 30 minutes. 4. When the ganache has solidified, cover the the cake with aluminum foil and refrigerate for about 30 minutes. 5. This cake can be made one day ahead and refrigerated. I learned how to make these mini-cheesecakes when I was 14 years old. The place was Watertown, Massachusetts. And my teacher was a great neighbor and friend, Susan Pallotta. Since then, these Christmas Cheesecakes have been the hit of all our holiday parties. They’re fun to make and easy to eat. 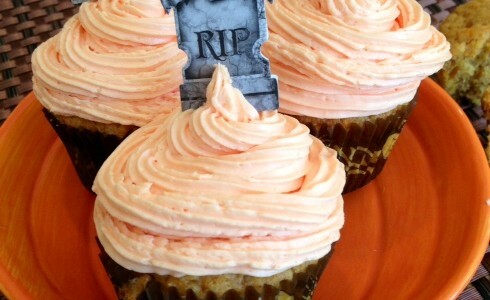 All you have to do is peel off the paper cups and enjoy the mini-cheesecakes. Btw, let me know if you miss washing the spatula and dessert plates. 1. In a 3-quart sauce pot set on a counter, stir together the dark cherries with the syrup and the sugar. Set aside on counter. 2. In a 2-cup bowl, mix together the cornstarch and the water. 3. Using a wooden spoon, gently stir the cornstarch-water mixture into the cherry mixture in sauce pot. 4. Set the sauce pot on a burner and bring the cherry mixture to a boil. Cook on medium-high heat and stir with a wooden spoon until mixture boils. 5. As soon as the cherry mixture comes to a boil, lower the heat to medium. Cook and stir until cherry filling begins to thicken. This will take 25 to 50 seconds. 6. When the cherry filling has thickened, gently transfer it to a glass or porcelain bowl. Cover the bowl and set it aside so that the cherry filling has time to cool. 2. Divide the paper cups among two muffin baking pans (each one should hold 12 paper cups). Set aside. 3. In a shallow bowl and using a fork, mix together the crumbs, cinnamon and either butter or oil. 4. When mixture is uniform, using a teaspoon, put some crumb mixture into each paper cup. 5. Using the back of an espresso spoon or small teaspoon, press down, into the crumb mixture. 6. Set the muffin pans with paper cups aside while you prepare cheesecakes. 1. In a 4-quart mixing bowl or in a stand mixer fitted with a bowl, beat together the above ingredients on high speed until mixture is creamy and smooth. 2. Drop 1 tablespoon of the cream cheese mixture over the crumb mixture in paper cups. 3. Set each muffin pan on its own rack in oven. 4. Bake the cheesecakes for 6 to 7 minutes. 5. After 6 to 7 minutes, invert the muffin pans. 6. Bake the cheesecakes for an additional 6 to 8 minutes or until tops look puffed and slightly crack. 7. After baking the cheesecakes, set them IN MUFFIN PANS on a counter to cool completely. 8. When the cheesecakes have cooled completely, lift them out of the muffin pans. To avoid crushing the still-soft cheesecakes, use both hands to grab the paper cups and lift them out. 9. Carefully set the cheesecakes on a serving platter. Cover them with plastic wrap and refrigerate until ready to serve. 10. As soon as the cherry filling has cooled to room temperature, set it in an airtight container. Refrigerate the cherry filling until the cheesecakes are ready to be served. 11. 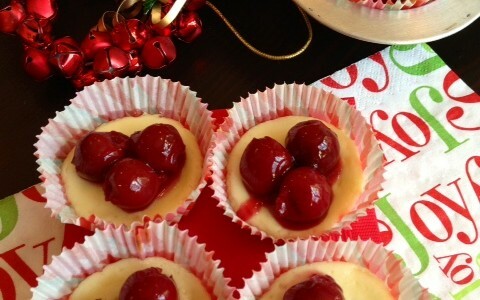 About 2 hours before serving cheesecakes, place 3 cherries on top of each one. Carefully cover the cheesecake platter with aluminum foil and refrigerate. 12. At serving time, remove the aluminum foil and set the cheesecakes on a table. Note: The cheesecakes and cherry filling can be made up to 2 days ahead and refrigerated. Summer is the season for peaches and plums. As I taste samples at various fruit stalls of the Santa Monica Farmers Market, I lose control and buy at least 15 to 20 pounds of both fruits. What’ll I do with all that fruit? After making some preserves, I’m thinking of making this peachy plum upside down cake for my next pool party. 2. Grease and flour the sides of springform pan. 3. Place parchment paper circle to fit in bottom of pan; set aside. 4. Squeeze lime juice into a 2 or 3-quart bowl and set aside. 5. Meanwhile, peel the peaches, cut them in half and remove pit. Thinly slice the peaches and place them in bowl with lime juice, giving them a light stir (be careful not to break the slices). Set aside. 6. Thinly slice the plums (do not peel them) and add them to the peaches in bowl. Give them a light stir and set aside. 7. Brush the parchment paper in pan with vegetable oil and then sprinkle it with 1/3 cup sugar; set pan aside. 1. In a 1-quart bowl, stir together the flour, baking powder and salt; set aside. 2. In a stand mixer fitted with a bowl, whisk together the eggs, sugar and vanilla extract (alternately, this step can be done with an electric hand mixer and regular bowl). Stir in the milk and mix well until batter is uniform. 3. Pour the batter over prepared fruit in pan. 4. Set the pan on a rack positioned in center of oven. 5. Bake the cake for 25 minutes. 6. After 25 minutes, test doneness of cake by inserting a sharp, pointed knife in its center. If knife comes out clean, the cake is done. 7. Since each oven heats differently, it may be necessary to bake the cake in additional increments of 5 minutes, testing doneness with knife each time. 8. When cake is done, transfer it (do not remove cake from pan) to a counter to cool. 9. Cool the cake in pan for 30 minutes. 10. After 30 minutes, invert cake onto a serving platter. 11. Remove sides of pan and peel off the parchment paper from cake. Serve cake, garnished with mint leaf sprigs and additional slices of peaches and plums. Optional: Garnish each cake slice with our 5-Minute Sweetened Whipped Cream recipe, previously published on this website (in Desserts, Creams & Sauces).